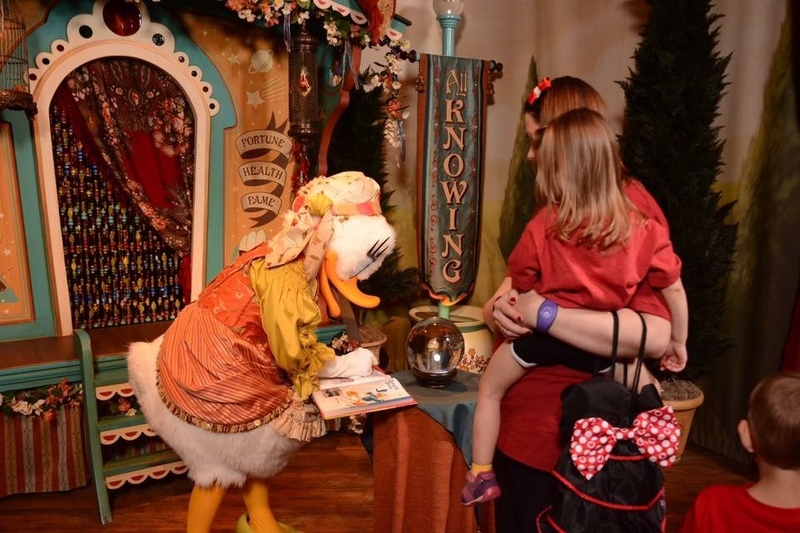 When I was planning for a Girl’s Trip to Disney World a couple of years ago, I was so tempted by the idea of being able to go through the much shorter lines for guests without bags. I didn’t have kids with me, so no need for a diaper bag. Not to mention, I had found this cool thing called a FlipBelt that I could wear around my waist to hold my phone and any cards I needed. We would whiz through security and get into the parks faster; great! ….and by the end of the first day all of that went out the window. My phone was almost dead and I needed my battery pack, my back was killing me but I didn’t have any medicine with me; the list goes on. Oh, and that FlipBelt I thought was so cool had become incredibly uncomfortable by the end of the day; I was ready to get it off and never put it back on. So, on our way out of Magic Kingdom we stopped and bought a string backpack to use for the remainder of our trip. 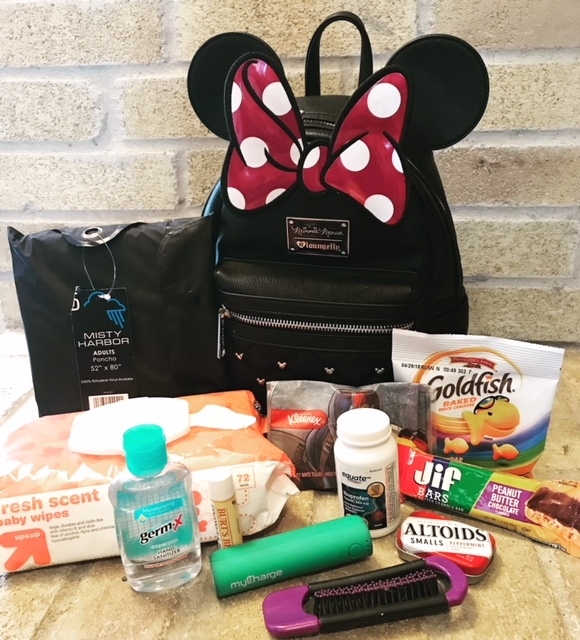 I hadn’t realized how much stuff I use/need while I am in the parks and have learned to enter the parks prepared for anything. – A portable phone charger. This one has outlets for two phones and can charge your phone multiple times. 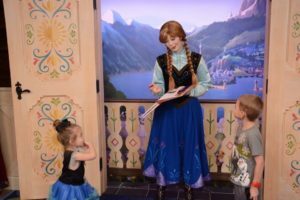 You are going to use your phone a lot in the parks between taking pictures and checking plans and wait times on My Disney Experience; you will want to make sure it is charged up and ready to go. If you don’t have one of your own before getting to the parks, you can find Portable Phone Charging Kiosks at all of the Disney World parks where you can purchase a charger for $30. After you have depleted the life of the pack, you can swap it for a fully recharged replacement. – Ponchos. It is Florida, it’s going to rain. I have yet to take a trip to Disney World where it hasn’t rained at least one day. When we took the kids for the first time, I made the mistake of not packing Ponchos (despite the fact that I had read many tips that I should pack them). We ended up having to buy a couple at one of the gift shops and that is not cheap; you will shell out almost $10 each for a poncho in the park. What happened after we bought those ponchos? It stopped raining….and didn’t rain for the rest of the trip. 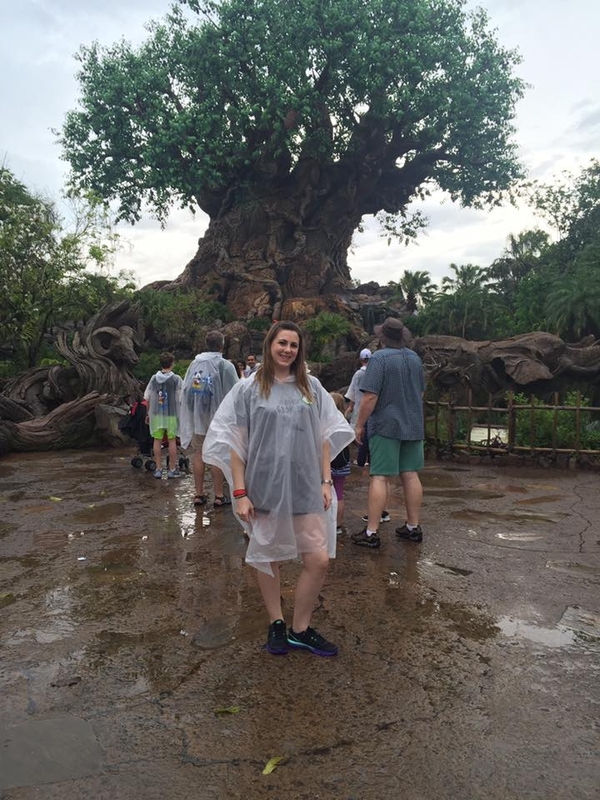 However, I learned my lesson and packed them for my next trip and got good use out of them when it rained half the day at Animal Kingdom. Not only are ponchos a necessity in case of rain, they are great to have for water rides where you don’t want to get completely wet and to protect any of your belongings. I recommend something like this, you can throw a few in your bag and throw them away after you have used them. – Medicine. Of course bring any medication that you regularly take on a day to day basis, but it doesn’t hurt to pack some Tylenol, Ibuprofen, etc. You never know when a headache will strike, or if you are anything like me, when your back will start hurting. – Bandaids. Most people walk more than 10 miles a day in the parks. If you get a blister or your shoes are rubbing your heel, bandaids are a great thing to have with you. Tip: Make sure you wear comfortable shoes, and it doesn’t hurt to bring an extra pair (in your suitcase, not your backpack). 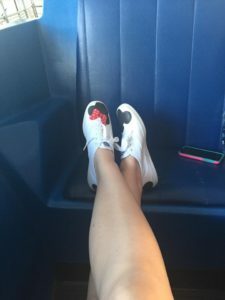 I made these adorable shoes for my Girl’s Trip but they only lasted a day. They did not provide a lot of support and rubbed my heel when I walked. Luckily I had packed an extra pair of shoes; it saved my feet from a lot more pain. These are my go to shoes for the parks, they are super comfortable. – Chap Stick/Lip Balm. I hate for my lips to feel chapped and dry. I always carry some kind of lip balm with me. It doesn’t hurt if it has an SPF. – Hair Ties & Brush. It is always nice to have these on hand to throw your hair up when you get hot or brush out the tangles in your hair from the rides. – Autograph Book & Pen/Sharpie. If you plan on meeting characters, you need an autograph book. When we have had the kids with us and done the autograph thing, we have always had a stroller so this isn’t necessarily something that goes in my bag. I usually throw them in the stroller basket. If you don’t have a stroller, you’ll want to put it in your bag. Don’t forget to bring something for the characters to sign with, I prefer a sharpie. Tip: The generic autograph books at Disney World are $7.95. The Disney Junior Encyclopedia of Animated Characters is a great alternative. There are pages for each character with a picture, a little background information, and sometimes fun facts about the character. It’s more like getting the characters to sign a year book. I have seen many people use these in the parks. Sometimes the characters will leave notes for their friends on another page. This book is from 2014, so some of the newer characters, like Princess Elena, are not in there but there are some blank pages at the front and back of the book that you could use for those characters to sign. – Change of clothes. This is a good idea if you are traveling with young kids and they have an accident. For yourself, a change of socks is a good thing to bring along if your feet get wet from rain or a water ride. – Jacket/Sweater. This of course depends on the time of year you are travelling. 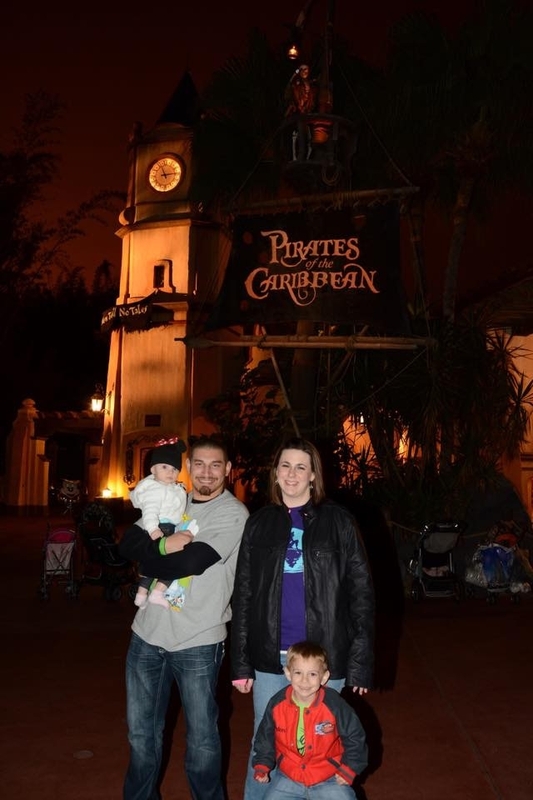 We typically go to Disney World in February and the temperature can vary greatly day to day. Mornings and evenings can be a little chilly so it’s a good idea to wear layers. If you don’t have a stroller to throw your jacket in, having a bag to put it in is great so you aren’t stuck carrying it around all day. – Wet Wipes or Baby Wipes. I pretty much always carry a pack of baby wipes with me. My kids are no longer in diapers, but you never know when you are going to have sticky hands or a dirty face. Plus they come in handy if you need to wipe off a dirty table or chair when you sit down to eat. – Gum/Mints. You may want to freshen up your breathe at some point during the day. If you forget to pack gum in your bag, don’t expect to find any in the park, they don’t sell it. You may find that there are things on my list that you don’t need, and that’s fine. 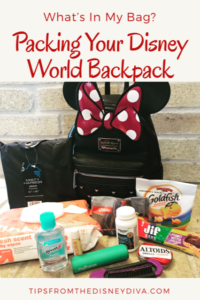 Pack your bag so that it suits you and your family’s needs; this is just what I have found that I need to get me through a day at Disney World. Also note, besides a change of clothes and baby wipes, this list does not include all of the things you will need for small children. I don’t pack those in my backpack (mostly because I usually carry a smaller bag), I bring a diaper bag and that gets put in the basket of the stroller. With babies and toddlers you will need diapers/pull ups, wipes, bottles/formula, baby food, etc. 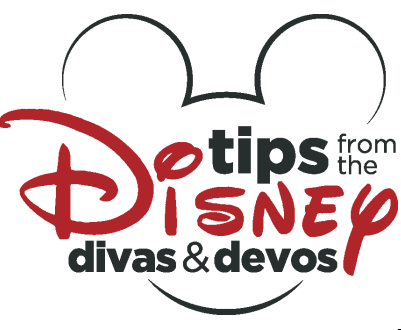 For a great list of things to pack when dining with a toddler at Disney, check out Fancy Free Diva’s article. 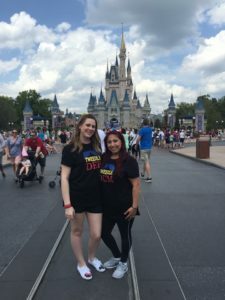 Are you ready to plan your trip to Disney? Contact Patricia at All For Dreams Travel for a quote. She can answer all of your questions, and best of all, her services are free! 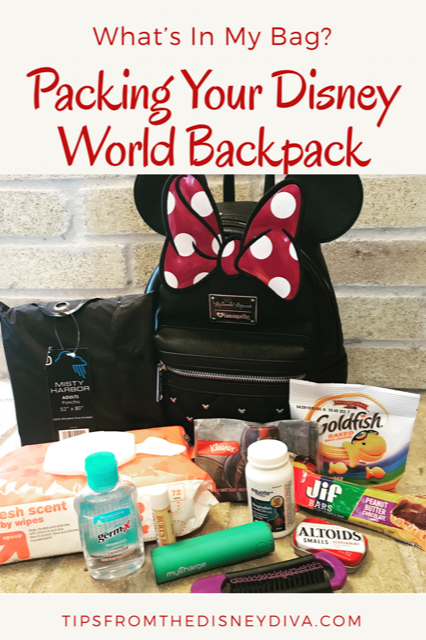 What should I pack in my Walt Disney World backpack? Hi, I'm Sleepy Diva! My love for Disney started at an early age and I am passing that on to my two kiddos. I am most happy when I am at Disney World. I love talking to people about all things Disney and doing crafts for my upcoming trips. Incase you couldn't tell by my name, I will never turn down a good nap! HAY mom thanks for the tips we are in the finish organizing…. Great tips, specially for the medicine. I’m always sore in the end and never thought about bringing it.